Currently in Balochistan, the journalists are facing extremely difficult situations. There is no journalism. Journalist community is enjoying no freedom of speech. In earlier times, a journalist would get threats from the militant groups or security agencies whenever he wrote or published any story against them. Nevertheless, unfortunately the scenario has changed now. The media houses become under pressure of security agencies and militant groups for publishing and reporting against them, and they forbid directly the media owners. Then the owners give instructions to the reporters. That is why the journalists feel insecure and they cannot report sensitive issues; true and investigative journalism has become difficult for them. Furthermore, if a journalist makes a report on a sensitive issue, but his channel or newspaper Head office does not run that news. Journalists in Balochistan have no dare to work on Baloch Insurgency and Missing persons. Moreover, there are different threat actors, beside militant groups, many political parties and religious groups are threatening the working journalists. For instance, if a journalist covered the mass gathering of a political party, and he shows less number of party supporters participated in mass gathering, the party will be against the journalist, though, the journalist would have reported the exact and real figure. Similarly, religious groups are also making different troubles in journalistic activities. The Journalists of Balochistan feel insecure whenever they write or report anything regarding religion. In addition to, beside the physical threats, now the journalists are facing financial threats. This is most alarming situation. Recently, more than a dozen media workers, including reporters, Cameramen, NLEs, and DSNG engineers, have been fired from their different media houses. These media houses are Jeo News TV, Express News, 24 News TV, 92 News TV, Abb Tak news and Jang Group. These peculiar situations prevailed due to the impacts of financial Crisis in national level media. Unfortunately, the crises and termination process of media workers in Balochistan will continue. In the same way, most of the media houses do not pay their district reporters. 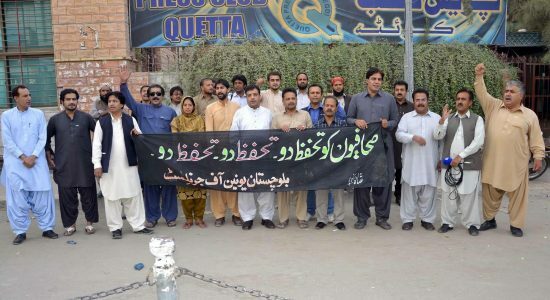 Majority of the reporters are working free except in Quetta. The news channels do not even pay for reporting expenses such as travel and communication. The Journalists are working in rural areas of the province, without any payment from their concerned news channels. They are very compelled to go far and flung areas for daily reporting. They do not have reporting facilities. Merely a mike, logo and cameras have given to the reporters just for the emergency reports, i.e. terrorism incidents, or very important personalities visit. Even the salaries of many media workers have been stop due to the ongoing financial crisis. All these journalists have no other way of earning except journalism. It would not be wrong; if we say the government of Balochistan is creating hurdles in native press industry. For last three years, the newspapers grants and advertisements were stop. The bills of advertisement were also stop from last eight months by the government of Balochistan. Due to that, the downsizing of newspapers have started, and fired multiple employees. On the other hand, the working Journalists of Balochistan have grievances that their media houses are not focusing on Balochistan issues. It surly seems the journalists have become disappointed. Most of the media houses are in Islamabad, Karachi and Lahore. They see the Balochistan journalism through their own glasses. They do not come here to see the peculiar situation faced by the journalists of Balochistan. Journalist’s organizations have many times protested and staged demonstrations against the ongoing journalism crisis. Nevertheless, the crises did not resolve. According to the report of Balochistan Union of Journalists (BUJ), in different incidents, more than forty working journalists have killed in Balochistan in last one decade. Unfortunately, none of these journalists has been served justice. Even, not a single killer of journalists has been identified, arrested and prosecuted. Sadly, the provincial government did not play a positive role in this worst case situation of media crisis and financial insecurity in Balochistan. These difficulties, downsizing, financial insecurity and job threats of the journalists will resolve if the government start giving advertisements to the news channels and newspapers. Second, if the journalist’s communities become one agenda unite without any discrimination and put pressure on the owners of media houses and owners of the newspapers, it will reverse the situation.